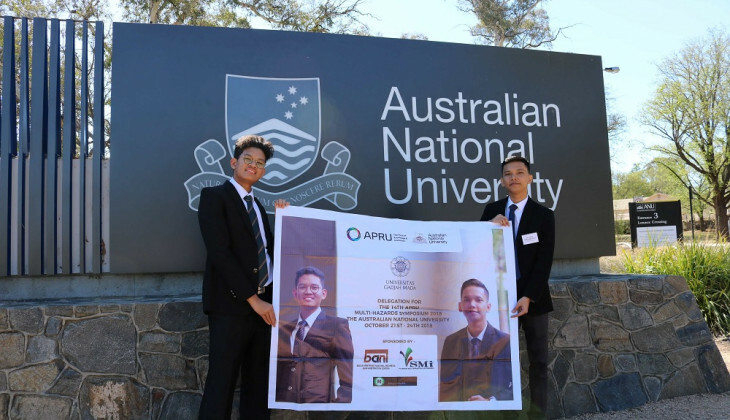 UGM students participated in the 14th Association of Pacific Rim Universities (APRU) Multi-Hazards Symposium 2018 being held from 20-24 October at The Australian National University, Canberra, Australia. The students were Muhammad Dzaky Alfajr Dirantona (Management 2015) and Naufal Fadhlullah Sayuti (Law 2014), who became the youngest participant in the forum. Dzaki said in the conference they submitted a scientific presentation themed On Building Resilience: Universitas Gadjah Mada (UGM) Student Community Service - Community Empowerment Learning (SCS-CEL). It described the capacity and contribution from UGM academics in disaster mitigation areas through Student Community Service - Community Empowerment project. “We took the study of landslide disaster in Giritirta village, Banjarnegara regency,” he said. Naufal added they presented their research in the panel of Universities, Education, Lessons to be Learned, Risk and Resilience. This panel focused more on how relations between academics, regional and national governments may contribute through education to improve the effectivity of disaster mitigation efforts. APRU is a prestigious international conference that aims at exploring research related to disaster risk reduction in disaster prone areas of Pacific Rim. The conference is a collaboration with International Research Institute of Disaster Science (IRIDeS), this time raising the theme Risk, Resilience and Reconstruction: Science and Governance for Effective Disaster Risk Reduction and Recovery in Australia and the Asia-Pacific.